I love the concept of the site Chocolate.org. I know there are tons of chocolate websites out there, but this one is unique in that it deals specifically with chocolatiers, bakers and chefs across the country. So you can browse through their selection of choices (from dark chocolate to cookies to popcorn and more) and find a specialized chocolatier or baker who will send the product directly to you. The good people at Chocolate.org offered for me to try out their cool service in exchange for an honest review, so I spent an hour (literally, there was so much to choose from!) trying to decide what to sample. I opted for a funky set of flavored popcorn (6 Section Rainbow Assorted Flavored Popcorn) from a little shop in Brooklyn called Sweetnes. 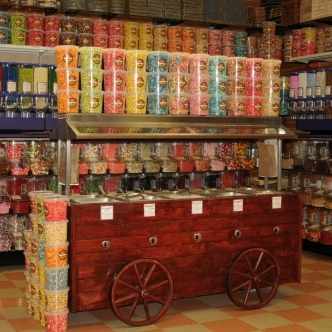 I like the idea of supporting small businesses, and Sweetnes is known for its unique gift baskets and gourmet popcorn. I knew this was something Mr. Jersey Momma would like, too (he's a big fan of candy). It was easy to order from Chocolate.org's site and my popcorn arrived super fast. The colorful wheel made a nice presentation (The Jersey Momma's Boy's eyes lit up when he saw that). It came packaged in a divided wheel shape in 6 bright colors (yellow, red, green, blue, orange and purple). One of the neatest things about this popcorn is that it's eye-catching! Sounds silly but all of the visitors we had over the weekend immediately asked, "What is that?" and everyone wanted to try it. It would make a nice presentation at a party or family event, for sure. And for some reason, The Jersey Doggy, Spot, was equally enamored with it. Can I has some popcorn, mama? The popcorn was technically a caramel popcorn batch, so think chewy instead of crispy crunchy. My only gripe was that it did not list the flavors on the package so we had to kind of guess what each flavor was. 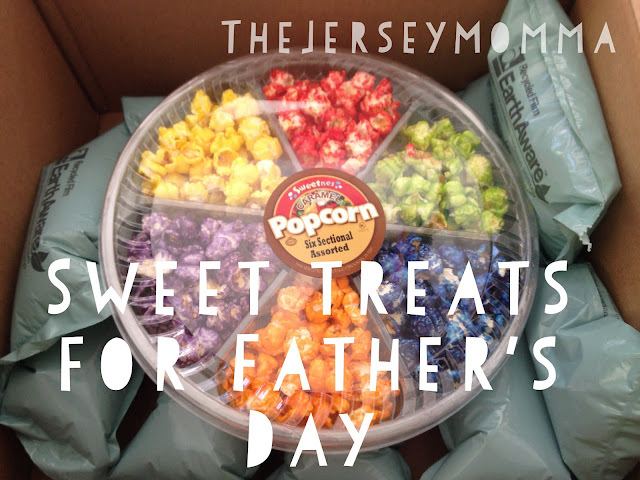 Mr. Jersey Momma was particularly fond of the green popcorn (green apple). There was a nice amount of popcorn in each section, so it lasted longer than we thought it would. This makes a great gift for the sweet lover, especially someone who likes the chewy taste of caramel popcorn. If you're interested in Chocolate.org you can check out their Facebook page or follow them on Twitter. Sweetnes doesn't have a Twitter account that I could find, but you can visit their website or find their cool products on Chocolate.org.